Chinese American participants needed for paid research study. Hey, Chinese Americans! 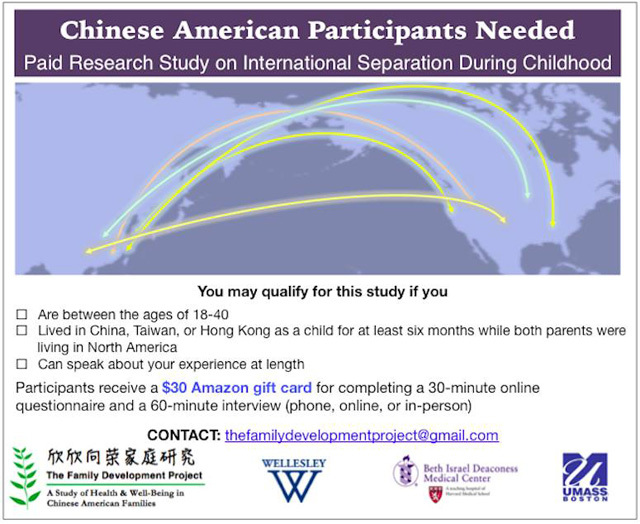 The Family Development Project is looking for participants for a paid research study on international separations during childhood. Specifically, they're looking for people who lived in China, Taiwan or Hong Kong as a child for at least six months while both parents were living in North America. If that's you and you'd like to share about experience, there are some people who would appreciate your help. • Lived in China, Taiwan, or Hong Kong as a child for at least six months while both parents were living in North America. • Can speak about your experience at length. To participate in the study, go here, or email thefamilydevelopmentprojct@gmail.com. And spread the word.